The Fermi Gamma-ray Space Telescope with its main instrument on-board, the Large Area Telescope (LAT), opened a new era in the study of high-energy emission from Active Galactic Nuclei (AGN). When combined with contemporaneous ground- and space-based observations, Fermi-LAT achieves its full capability to characterize the jet structure and the emission mechanisms at work in radio-loud AGN with different black hole mass and accretion rate, from flat spectrum radio quasars to narrow-line Seyfert 1 (NLSy1) galaxies. Here, I discuss important findings regarding the blazar population included in the third LAT catalog of AGN and the γ-ray emitting NLSy1. Moreover, the detection of blazars at redshift beyond three in γ rays allows us to constrain the growth and evolution of heavy black holes over cosmic time, suggesting that the radio-loud phase may be important for a fast black hole growth in the early Universe. Finally, results on extragalactic objects from the third catalog of hard LAT sources are presented. Relativistic jets are one of the most powerful manifestations of the release of energy related to the super-massive black hole (SMBH) at the center of active galactic nuclei (AGN). In about 10% of AGN, termed radio-loud AGN, the accretion disc is at the base of a bipolar outflow of relativistic plasma, which may extend well beyond the host galaxy, forming the spectacular lobes of plasma visible in the radio band. The jet emission is observed across the entire electromagnetic spectrum, from radio to γ rays. When the jet axis is closely aligned with our line of sight, the rest-frame radiation is strongly amplified due to the Doppler boosting with a large fraction of the output observed at higher energies, and giving rise to the blazar phenomenon. Blazars are traditionally divided into flat spectrum radio quasars (FSRQ) and BL Lac objects, based on the presence or not, respectively, of broad emission lines (i.e., Equivalent Width > 5 Å) in their optical and UV spectrum (e.g., Stickel et al., 1991). Recently, a new classification based on the luminosity of the broad line region (BLR) in Eddington luminosity was proposed by Ghisellini et al. (2011): sources with LBLR/LEdd higher or lower than 5 × 10−4 being classified as FSRQ or BL Lacs, respectively, in agreement with a transition of the accretion regime from efficient to inefficient between these classes. 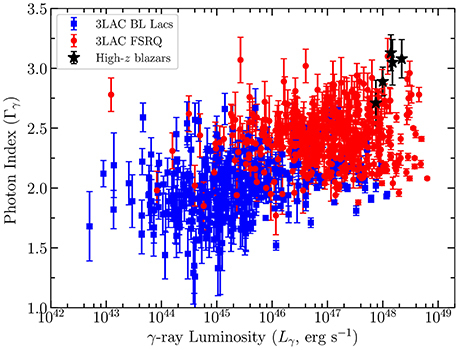 The spectral energy distribution (SED) of blazars are characterized by two bumps with the lower energy peak occurring in the IR/optical band in the FSRQ and at UV/X-rays in the BL Lacs. This first peak is univocally interpreted as synchrotron radiation from highly relativistic electrons in a jet. The SED higher energy peak, observed at MeV–GeV energies in the FSRQ and at GeV–TeV energies in the BL Lacs, is commonly interpreted as inverse Compton scattering of seed photons, internal or external to the jet, by the same relativistic electrons (e.g., Ulrich et al., 1997). However, other models involving hadronic processes have been proposed (e.g., Böttcher et al., 2013). Fossati et al. (1998) proposed that the SEDs of blazars form a spectral sequence, with the position of the two peaks governed by the observed bolometric luminosity: blazars with lower luminosities have the peaks at higher energies. This was theoretically interpreted by Ghisellini et al. (1998) in terms of different radiative cooling suffered by the electrons emitting at the two peaks. Radio galaxies are viewed at larger angles than blazars, with less severe boosting effects and classified as Fanaroff-Riley type I (FR I) and type II (FR II) based on their radio power and morphology (Fanaroff and Riley, 1974). Following the Unified model of AGN proposed by Urry and Padovani (1995), FR I and FR II radio galaxies are the non-aligned (to the observer viewing angle) parent populations of BL Lac and FSRQ, respectively. The discovery by Fermi-LAT of variable γ-ray emission from a few radio-loud narrow-line Seyfert 1 galaxies (NLSy1) suggested this as the third class of AGN with a relativistic jet (Abdo et al., 2009). The Fermi Gamma-ray Space Telescope with its main instrument on-board, the Large Area Telescope (LAT), opened a new era in the study of high-energy emission from AGN. The γ-ray sky observed by Fermi-LAT is dominated by AGN that are ~60% of the sources included in the Third Fermi LAT source catalog (3FGL; Acero et al., 2015). Apart from a handful of starburst galaxies, for which the γ-ray emission originates from the interaction of cosmic rays with gas and interstellar radiation fields (Ackermann et al., 2012), almost all the extragalactic sources are associated with radio-loud AGN. Important findings regarding the blazar population included in the 3FGL and the NLSy1 are discussed in section 2 and 3, respectively. The high-redshift blazars detected in γ rays are discussed in section 4, while the third catalog of hard LAT sources is presented in section 5. Concluding remarks are reported in section 6. Several γ-ray source catalogs, both general and for specific class of objects (i.e., AGN, pulsars, supernova remnants, pulsar wind nebulae, gamma-ray bursts) have already been produced by the LAT Collaboration. The 3FGL was used as a starting point for producing a catalog of AGN only: the Third LAT AGN catalog (3LAC; Ackermann et al., 2015). The 3FGL includes 3033 sources detected after four years of operation with a Test Statistic1 greater than 25, corresponding to a significance > 4σ; 2,192 sources are detected at Galactic latitude ∣b∣ > 10°. 1,563 sources (71% of the 3FGL objects at ∣b∣ > 10°) are associated at high-confidence with 1,591 AGN (28 objects have two possible associations), which constitute, together with the low-latitude AGN, the 3LAC sample. Most of the high-latitude objects (98%) are blazars. The 3LAC includes radio-loud AGN of different types: 467 FSRQ, 632 BL Lacs, 460 BCU (Blazar with Uncertain Classification) and 32 non-blazar AGN. Among the non-blazar AGN there are 12 FR I, 3 FR II, 8 steep spectrum radio sources and 5 NLSy1. Associations for 182 low-latitude (∣b∣ < 10°) AGN are reported in the 3LAC: 24 FSRQ, 30 BL Lacs, 125 BCU and 3 non-blazar AGN. Extrapolating the number of high-latitude sources to low-latitude and assuming the same sensitivity, ~340 sources would have been expected. The discrepancy between expected and associated source numbers is likely due to a higher Galactic diffuse emission background and a higher incompleteness of the catalogs of counterparts at low-latitude. On average, sources with high γ-ray luminosity (mostly FSRQ) are found to have softer spectra than sources with low γ-ray luminosity (mostly BL Lacs), in agreement with the “blazar sequence” (Ghisellini et al., 1998) and the “blazar divide” (Ghisellini et al., 2009), with the exception of a few outliers (high-synchrotron-peaked-FSRQ and high-luminosity high-synchrotron-peaked BL Lacs). A strong anti-correlation between the synchrotron peak position (νpeak) and the spectral index (Γγ) is observed for FSRQ and BL Lacs. A similar trend is noticed for BCU supporting the idea that BCU with low νpeak and high Γγ are likely FSRQ, while BCU with high νpeak and low Γγ are likely BL Lacs. Based on the 3LAC results, the blazar sequence was recently revised by Ghisellini et al. (2017): FSRQ display approximately the same SED as the luminosity increases, following a sequence only in Compton dominance (i.e., the ratio of the Compton to synchrotron peak luminosities) and in the X-ray slope, while BL Lacs become “redder” (i.e., the peak frequencies becomes smaller) when more luminous. Moreover, a correlation between the jet power and the accretion power has been found in blazars, with the jet power dominating over the accretion disc luminosity by a factor of 10 and somewhat larger than the entire gravitational power (Ghisellini et al., 2014). At the time of writing, 70 AGN have been detected at TeV energies and listed in the TeVCat2 All these sources are present in the 3LAC except for HESS J1943+213. A large fraction (> 75%) of blazars detected by Swift-BAT in hard X-rays have also been detected by Fermi-LAT. The blazars detected by Fermi-LAT in γ rays after 4 years of operation represent a sizeable fraction of the entire population of known blazars as listed in the BZCAT (Massaro et al., 2009). The overall LAT-detected fraction is 24% (409/1,707) for FSRQ, 44% (543/1,221) for BL Lacs and 27% (59/221) for BCU. No strong differences in the radio, optical and X-ray flux distributions are observed between γ-ray detected and non-detected blazars in the BZCAT, suggesting that all blazars could eventually shine in γ rays at LAT-detection level. More BL Lacs than FSRQ have been detected by Fermi-LAT so far. This may be related to a longer duty cycle of FSRQ with respect to BL Lacs in γ rays. The discovery of variable γ-ray emission from a few NLSy1 confirmed the presence of relativistic jets in these objects. In addition to the 5 objects reported in the 3LAC, Fermi-LAT has recently detected γ rays from other 3 new NLSy1: FBQS J1644+2619 (D'Ammando et al., 2015), B3 1441+476 and NVSS J124634+476 (D'Ammando et al., 2016). Luminosity, variability, and spectral properties of these NLSy1 in γ rays indicate a blazar-like behavior (e.g., D'Ammando et al., 2016). Apparent superluminal jet components were detected in SBS 0846+513 (D'Ammando et al., 2012), PMN J0948+0022, and 1H 0323+342 (Lister et al., 2016), supporting the presence of relativistic jets in this class of objects. The detection of relativistic jets in a class of AGN thought to be hosted in spiral galaxies with a BH mass typically of 106-107 M⊙ (e.g., Deo et al., 2006), challenges the theoretical scenarios of jet formation (e.g., Böttcher and Dermer, 2002), suggesting two possible interpretations: either relativistic jets in NLSy1 are produced by a different mechanism or the BH mass in NLSy1 is largely underestimated. In the last years it has been claimed that the BH mass of NLSy1 maybe underestimated due either to the effect of radiation pressure from ionizing photons on BLR (Marconi et al., 2008) or to projection effects (Baldi et al., 2016). By considering these effects, NLSy1 have BH masses of 108–109 M⊙, in agreement with the values estimated by modeling the optical-UV part of their spectra with a Shakura and Sunyaev disc spectrum (e.g., Calderone et al., 2013). This may solve the problem of the minimum BH mass predicted in different theoretical scenarios of relativistic jet formation, but leaves open the host galaxy issue. Spiral galaxies are usually formed by minor mergers, with BH masses typically ranging between 106–107 M⊙ (e.g., Woo and Urry, 2002), so it would not be clear how powerful relativistic jets could form in these galaxies. It is worth mentioning that the morphological classification has been done mainly for radio-quiet nearby NLSy1. Among the NLSy1 detected by Fermi-LAT up to now, the morphology of the host galaxy has been investigated only for 1H 0323+342, PKS 2004−447, and FBQS J1644+2619. Observations of 1H 0323+342 with the Hubble Space Telescope and the Nordic Optical Telescope revealed a structure that may be interpreted either as a one-armed spiral galaxy (Zhou et al., 2007) or as a circumnuclear ring produced by a recent merger (Anton et al., 2008; Leon Tavares et al., 2014). A pseudo-bulge morphology of the host galaxy of the NLSy1 PKS 2004−447 and FBQS J1644+2619 have been claimed by Kotilainen et al. (2016) and Olguin-Iglesias et al. (2017), respectively, but no conclusive results have been obtained so far. Hence, it is crucial to determine the type of galaxy hosting γ-ray emitting NLSy1 and their BH mass. For this reason near-infrared observations in J band of FBQS J1644+2619 were performed using the Canarias Infrared Camera Experiment (CIRCE) at the Gran Telescopio Canaries. The 2D surface brightness profile of the source is modeled up to 5 arcsec by the combination of a nuclear component, associated with the AGN contribution, and a bulge component with a Sérsic index n = 3.7, indicative of an elliptical galaxy. The structural parameters of the host are consistent with the correlations of effective radius and surface brightness against absolute magnitude measured for elliptical galaxies. From the infrared bulge luminosity, a BH mass of (2.1 ± 0.2) × 108 M⊙ was estimated (D'Ammando et al., 2017). All these pieces of evidence strongly indicate that the relativistic jet in the NLSy1 FBQS J1644+2619 is produced by a massive BH in an elliptical galaxy, as expected for radio-loud AGN. High-redshift blazars are the most powerful radio-loud AGN in the Universe and are bright targets in hard X-rays, representing a significant fraction of the extragalactic hard X-ray sky. However, they are not commonly detected in γ rays. In fact, high-redshift (z > 2) blazars represent <10% of the AGN population observed by Fermi-LAT so far. Flaring activity in the γ-ray energy range from these sources is even more uncommon, with only fourteen FSRQ at z > 2 detected during a γ-ray flare. In the 3LAC there are 64 objects at z >2 (~3.7 per cent of the γ-ray sources associated with AGN) at z >2, and only 2 at z >3: PKS 0537−286 (z = 3.104) and TXS 0800+618 (z = 3.033). On the other hand, 13 blazars at z > 3 have been detected in hard X-rays by Swift-BAT, INTEGRAL-IBIS, and NuSTAR so far. Hard X-ray observations are more suitable for detecting blazars at z >3, and this is mainly due to a spectral bias. In fact, the inverse Compton peak of high-redshift blazars is shifted toward lower energies as the bolometric luminosity increases. Only 10 sources at z >2 are in both the 3LAC and the Swift-BAT 70-month catalog (Baumgartner et al., 2013). All high-redshift blazars listed in both 3LAC and Swift-BAT Catalogs have an average γ-ray luminosity Lγ > 2 × 1048 erg s−1, indicating that only the most luminous blazars have been detected by both instruments. Furthermore, only blazars with an X-ray photon index ΓX < 1.6 have been detected in γ rays, while no dependence on the X-ray spectral luminosity seems to be present (D'Ammando and Orienti, 2015). As said above, high-redshift blazars at z > 3.1 are missing in the Fermi catalogs. These objects typically have large bolometric luminosities (Lbol > 1048 erg s−1) and harbor extremely massive BH (MBH ~ 109 M⊙). The new Pass 8 data set, with an improved event-level analysis, substantially enhances the sensitivity of the LAT, in particular at lower energies, increasing the capability of the LAT to detect sources with soft spectra like the high-redshift blazars. By analysing 92 months of Pass 8 data between 60 MeV and 300 GeV of a large sample of radio-loud quasars, 5 new γ-ray emitting blazars at z > 3.1 have been detected with high significance. Among them, NVSS J151002+570243 (z = 4.31) is now the most distant γ-ray emitting blazar so far. All the blazars discovered show steep γ-ray spectra (Γγ > 2.5), indicating an IC peak at MeV energies. These five sources lie in the region of high γ-ray luminosities (Lγ > 1047 erg s−1) and soft photon indices (Figure 1) typical of powerful blazars (Ackermann et al., 2017). Among the 5 new high-redshift blazars there are (at least) two with redshift between 3 and 4 with a MBH > 109 M⊙, implying the presence of 2 × 2Γ2 (i.e., 675, adopting Γ = 13) similar objects but with a misaligned jet in the same range of redshift. This changes the estimate of the space density of very massive BH hosted in jetted sources to 68-24+36 Gpc−3. As a consequence at z ~ 4 we should have a similar number of SMBH hosted in radio-loud and radio-quiet sources and, given their strong evolution, above that redshift most massive BH might be hosted in radio-loud AGN. This suggests that the radio-loud phase can be a key ingredient for a rapid BH growth in the early Universe. Figure 1. Photon index vs. γ-ray luminosity plane for 3LAC and high-redshift blazars at z > 3.1 detected in γ rays. Adapted from Ackermann et al. (2017). In addition to the Fermi-LAT catalogs with the standard low-energy threshold of 100 MeV, three hard source catalogs have been released: the First Fermi-LAT Catalog of Sources above 10 GeV (1FHL; Ackermann et al., 2013), based on the first three years of data analyzed in the 10–500 GeV energy range, the Second Catalog of Hard Fermi-LAT Sources (2FHL; Ackermann et al., 2016), based on 80 months of data analyzed in the 50 GeV–2 TeV energy range, and the Third Catalog of Hard Fermi-LAT Sources (3FHL; Ajello et al., 2017), based on 7 years of data in the 10 GeV–2 TeV energy range. The 3FHL contains 1556 objects and takes advantage of the improvement provided by Pass 8 by using the PSF-type event classification. The 3FHL includes 214 new γ-ray sources never appeared in previous Fermi catalogs. Three of these 214 have been detected with the Imaging Atmospheric Cherenkov Telescopes (IACT). The vast majority of detected sources (79%) are associated with extragalactic counterparts at other wavelengths, including 16 sources located at high-redshift (z > 2): 11 FSRQ, 3 BL Lac, and 2 BCU. BL Lacs are the most numerous extragalactic population (61%) followed by BCU (23%) and FSRQ (14%). Only 72 of the 3FHL extragalactic sources have been already detected by current IACT. In this context, the 3FHL is a resource for planning observations of the current (MAGIC, VERITAS, H.E.S.S.) and future (Cherenkov Telescope Array) IACT observatories. Interestingly, a few highest-energy photons from distant blazars included in the 3FHL Catalog are in the region around and beyond the cosmic γ-ray horizon [i.e., the energy at which the cosmic optical depth τ = 1, see e.g., Dominguez et al. (2013)] as shown in Figure 2. These photons provide important constraints on extragalactic background light models as they may also help in the understanding of γ-ray propagation over cosmological distances. Figure 2. 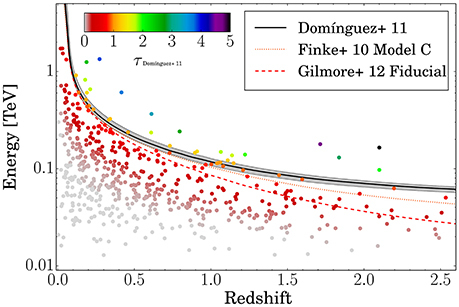 The highest-energy photons vs. redshift for 3FHL blazars, color coded by the optical depth calculated from the model presented by Dominguez et al. (2011). The cosmic γ-ray horizon based on different EBL models is shown. Adapted from Ajello et al. (2017). Fermi-LAT has been performing the first all-sky survey in γ rays, gathering well-sampled, continuous light curves for hundreds of AGN and compiling source catalogs for different energy ranges and time periods. These observations constitute important resources to the astronomical community for a better understanding of the jet physics, cosmological evolution, and accretion processes of SMBH. In fact, the Fermi-LAT observations, in conjunction with the multi-frequency data collected from radio to VHE, are key to revealing the nature of jet physics in different classes of AGN, including particle acceleration, environmental effects, and interaction processes. In addition, Pass 8 LAT data have increased the sensitivity for hard-spectrum sources, which are important targets for ground-based VHE telescopes including the planned Cherenkov Telescope Array. Moreover, the extended energy range reached by the Pass 8 data opens new opportunities for the study of blazars at high redshifts. Over the next years the Fermi satellite will provide a fundamental contribution in time domain astronomy and multi-messenger/multi-wavelength studies. The Fermi-LAT Collaboration acknowledges support for LAT development, operation and data analysis from NASA and DOE (United States), CEA/Irfu and IN2P3/CNRS (France), ASI and INFN (Italy), MEXT, KEK, and JAXA (Japan), and the K.A. Wallenberg Foundation, the Swedish Research Council and the National Space Board (Sweden). Science analysis support in the operations phase from INAF (Italy) and CNES (France) is also gratefully acknowledged. This work performed in part under DOE Contract DE-AC02-76SF00515. 1. ^The Test Statistic is defined as TS = 2 × (logL1 - logL0), where L is the likelihood of the data given the model with (L1) or without (L0) a point source at the position of the target (e.g., Mattox et al., 1996). Copyright © 2017 D'Ammando. This is an open-access article distributed under the terms of the Creative Commons Attribution License (CC BY). The use, distribution or reproduction in other forums is permitted, provided the original author(s) or licensor are credited and that the original publication in this journal is cited, in accordance with accepted academic practice. No use, distribution or reproduction is permitted which does not comply with these terms.